Every time you look for an example of a project made with Blender involving architecture, you probably will find residential or office spaces. 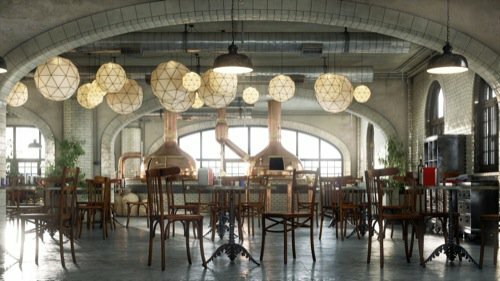 Here is a project that you won't find every day as an example of architectural visualization made with Blender; a brewery! You may remember digital artist Enrico Cerica from previous projects related to architecture. His new project is an old brewery bar. All 3d models from the project came from Blender. The render of choice this time was Octane. According to the artist, each image took on average 2-3 hours to render depending on the camera. Visit this thread at the BlenderArtists forums for the complete set of images of the project. By the number of details from each image, I suppose render times would be much higher using s single GTX. Not only you will see an impressive view from the brewery bar, but also something like a small lounge and working stations. Attention to detail is impressive on all images.